The defining characteristic of this house is its contextual responsiveness. 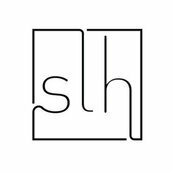 While contemporary in expression, it relates to its Lincoln Square location in a number of ways. Its scale aligns with the surrounding century-old houses. The generous front porch repeats a common detail of the block and serves as a spot to hang and out socialize with neighbors. 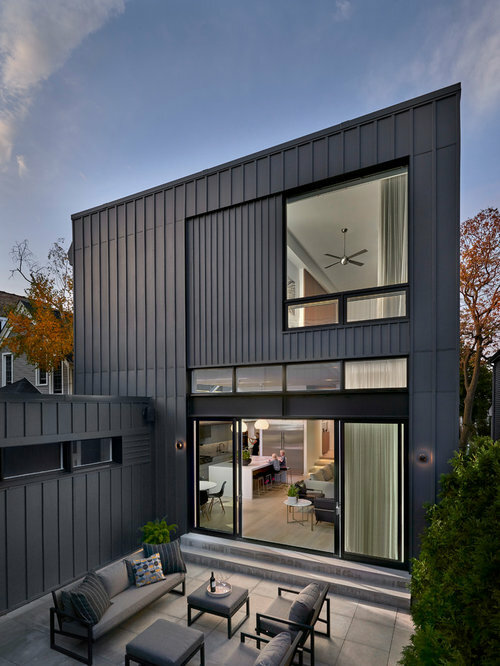 The exterior’s board and batten siding was inspired by the wood cladding of other frame houses in the district. 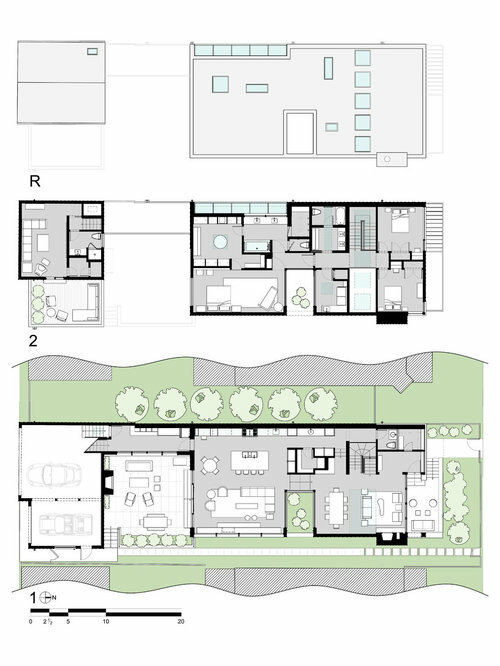 While the site had many advantages, one contextual constraint was the pair of large houses that hug the property. These structures prompted the pulling of sunlight into the interior in innovative ways without compromising privacy. 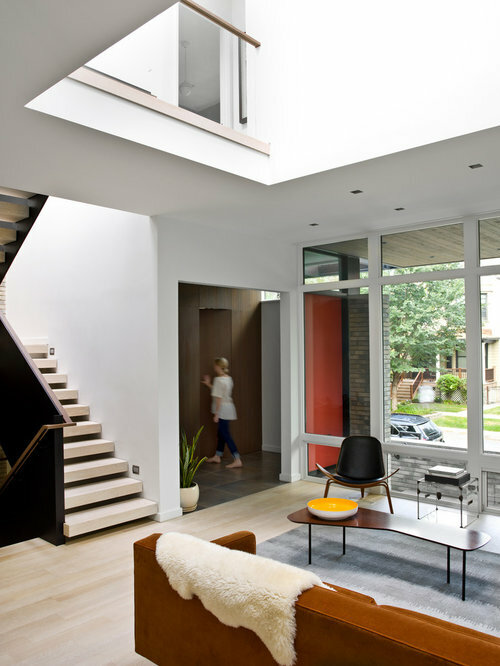 An exterior atrium cuts into the core of the house bringing light into what normally would be its darkest parts. The atrium footprint is evoked in a double height space that houses the staircase and it is topped with a series of skylights that flood the space with light on even the cloudiest of days. 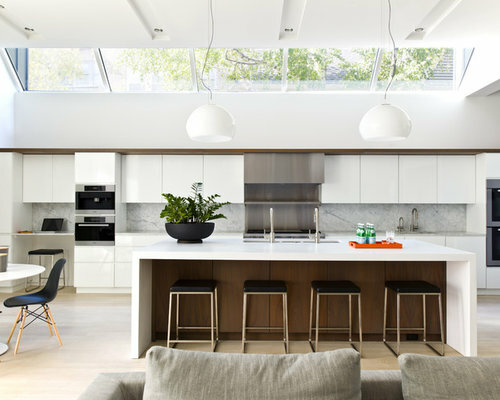 Clerestory windows appear at multiple locations including on the west side of the kitchen where they perfectly frame the view of a large birch tree and provide a wash of light along the surface of the ceiling at sunset. 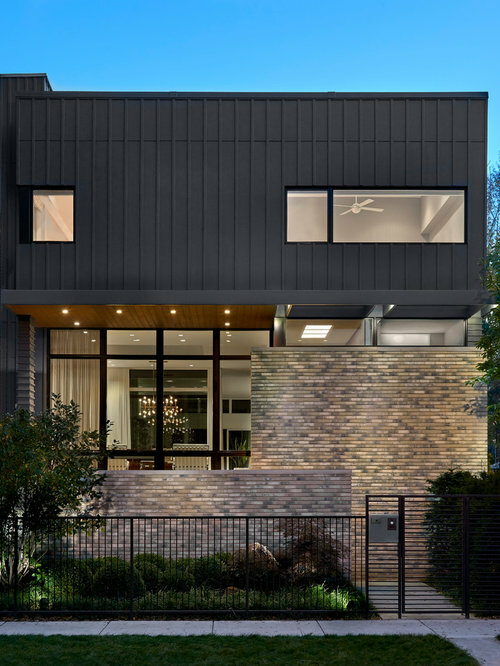 A slight tinting on the south facing windows minimizes solar heat gain at the back of the house while the same tint on the street facing windows enhances privacy. Despite the expanses of glass, the house far surpasses energy standards due to a number of features. A carefully calibrated mix of seven types of insulation optimizes thermal performance. Motorized dampers reduce energy costs and increase comfort. The neighborhood, with its direct links to public transportation, plethora of services, and its extreme walkability embraces the best aspects of urban living. The raised back patio is just two steps down from the great room/kitchen. On the left is the mudroom which links the house to the garage and home theater. Just out of view is an outdoor fireplace. The dining room is flanked by an open air courtyard featuring a view through to kitchen beyond. 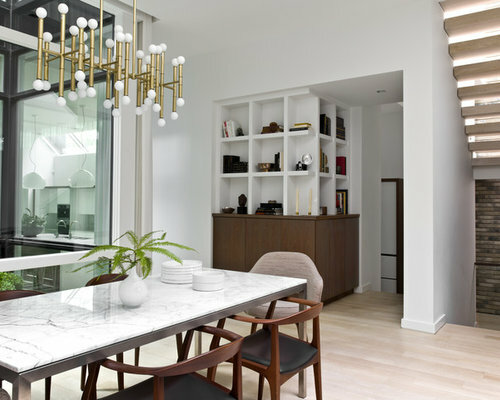 The open shelving turns the corner and runs to a set of stairs leading down a half level to a bar and passage below the stair landing that leads to a concealed powder room. The closed walnut cabinetry is in the same material as the nearby staircase railing. The stairs leading down to the basement and up to the second floor. The rear wall is the same brick used on the exterior of the house. A series of skylights above flood the space with light. The passage on the lower level at the back leads to a concealed powder room. 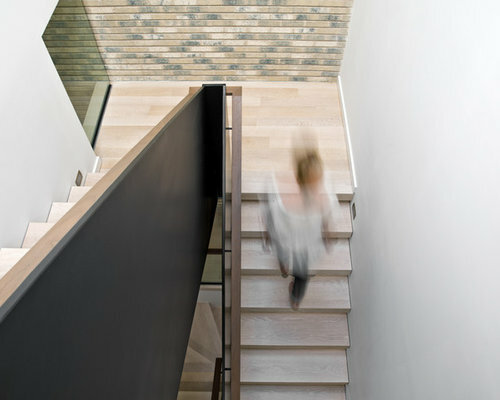 The staircase consists of a folded plate of metal, open white oak treads, and a winding walnut railing. The wall of walnut cabinetry hides ample storage and a compact desk for each of the two children. 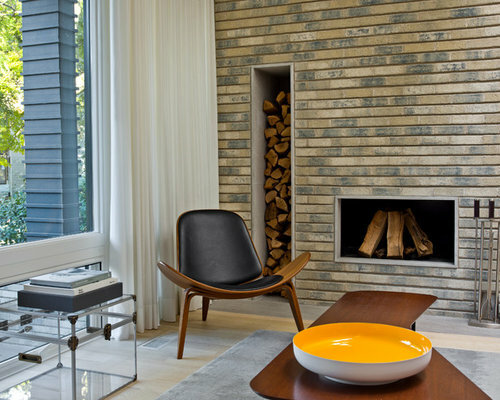 The vent free fireplace is fronted with a Carrara marble surround and floating hearth that can also be used for seating. The open air atrium/courtyard is in the background. The band of clerestory windows above the cabinetry brings in additional light without sacrificing privacy. 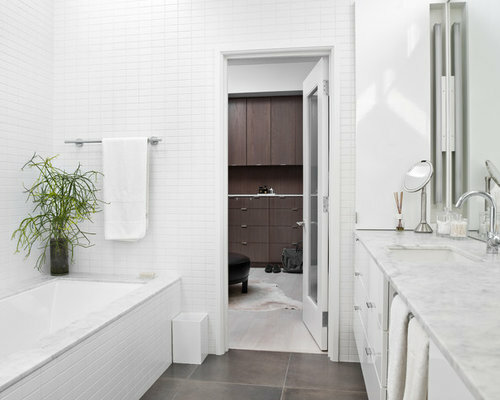 The master bath walls are clad in simple 2x4 white ceramic tile. A skylight above the tub brings in light as does a band of clerestory windows above the sinks. The high gloss of the cabinetry contrasts subtly with the matte tile finish. The master closet beyond is lined in walnut cabinetry and another skylight is positioned above the center of the space. Looking down from the second floor landing. The rear wall is the same brick used on the exterior of the house. A series of skylights above flood the space with light. At the landing is an interior window that brings light into a back hallway that houses a bar and pantry. 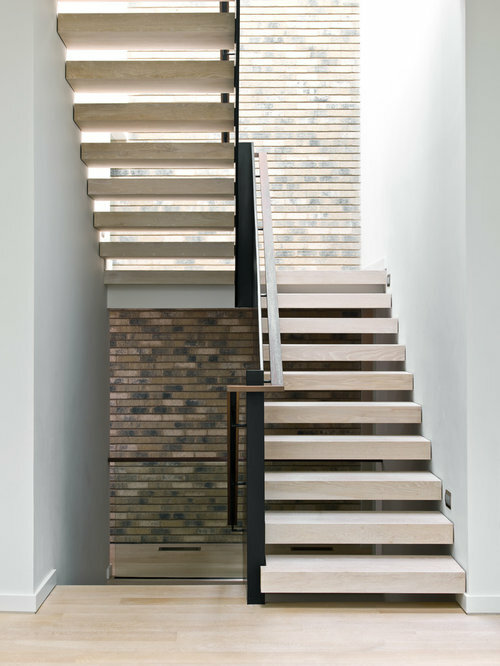 The staircase consists of a folded plate of metal, open white oak treads, and a winding walnut railing. 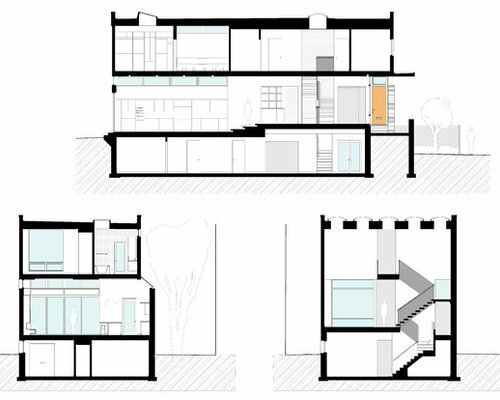 Sections showing the various ways light is brought into the house by the use of skylights, clerestory windows, the open air atrium, an interior window and large sliding doors at the patio. From bottom to top - the first, second, and roof level plans. The three distinct outdoor spaces on the first level are the covered front porch, open air atrium, and raised back patio. The second level landing overlooks a double height space. The roof level plan shows the large number of skylights used to bring light into the home.